Heartland Music Together - What is Music Together? Imagine a music class where babies, toddlers, and young children can learn music by playing and exploring rather than through formal lessons. Where adults get to play and sing with their children. Where you don't have to be an expert to join the fun! Music Together is an early childhood music curriculum that's known around the world for its ability to engage children and adults in musical play together. Educators, scientists, and musicians love Music Together for the depth of its research and developmentally appropriate activities. 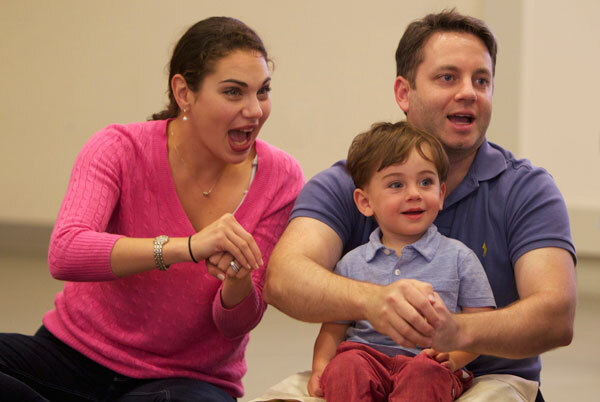 Families love Music Together for the way it helps bring children and adults together for quality play and learning. Children love Music Together because it's so fun. We speak the language of childhood! Your child was born already able to make some sense of music, and hungry to learn more. Whether your child is newborn or has been around the sandbox a few times, your child almost certainly already responds to music! When we play together, great things happen! If we give children the right support at the right time, all children can achieve basic music competence – the ability to sing in tune, keep a beat, and participate with confidence in the music of their culture. That's where you come in. You don't have to be musically skilled, just willing to share some fun with your child. We'll help with all the rest. We'll give you songs, recordings, play ideas, support, and more. We speak the language of parenthood too! For more information about the Music Together curriculum, visit the national website, MusicTogether.com.